Welcome to the Department of Agronomy, an academic unit with a vision to be a world-class tropical centre for training and research in the Crop, Soil and Horticultural Sciences. Our mission is to develop and deliver educational and research programmes, manage renewable natural resources with a focus that fosters the creation and propagation of agricultural plant production systems that are profitable, environmentally sound, socially responsive, and sustainable. 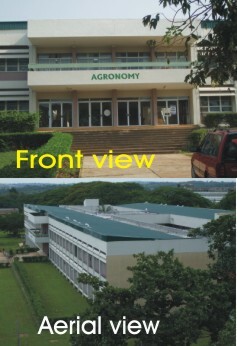 This is the first Department of Agronomy among Nigerian Universities and was established in 1967 where the Postgraduate School is now located. There are exciting opportunities for those that would like a career in the core agricultural production systems of the world. Areas of training at the postgraduate level include: Soil Sciences (Soil Fertility, Soil Microbiology, Soil Physics and Water Relations, Soil Survey and Classification, Soil Minerology, Soil Chemistry, Land Use Planning, Pedology and Agrometeorology/Agricultural Systems simulation models); Agricultural Mechanization (Ergonomics, Farm Machinery/Tillage and Irrigation); Crop Sciences (Field Crops Production, Pasture Agronomy, Seed Science and Technology, Plant Breeding, Tissue Culture, Weed Science, Farming Systems, Plant Nutrition and Crop Physiology); and Horticultural Sciences (Pomology, Olericulture, Floriculture, Post-Harvest Physiology & Processing and Landscaping). We are endowed with a variety of resources both within the immediate University environment and the country at large. Needless to say, our country is uniquely blessed with different agro-climatic conditions (temperate inclusive, though largely tropical) which makes agronomic research extremely exciting. Many nationals from outside Nigeria have been trained in our Department. Some of our graduates are occupying prominent positions in many parts of the world in both developed and developing countries. Our trainers are very prominent in many International and National agencies as consultants. We maintain collaborative linkages with other institutions within and outside the country. The International Institute of Tropical Agriculture (IITA), Ibadan is one of such institute. The Department has benefitted twice from grant awards by the Alliance for a Green Revolution in Africa (AGRA) for training students in Plant Breeding and Seed Production. The Department of Agronomy also hosts and trains plant breeding students of the Pan African University (PAU) of the African Union. The Department has modern laboratories, two reading rooms (Prof. A. A. A. Fayemi and Postgraduate Students’ Reading Rooms) with uninterrupted access to on-line and off-line electronic resources, to complement the Kenneth Dike Central Library and the Faculty Library. The Department houses a Soil Museum containing soil monoliths from southern Nigeria and it is currently developing a Crop Museum. We pride ourselves in working as a family with strong, progressive relationships among trainers and with the trainees. Our common point of convergence usually climaxes in a “happy hour” at weekly academic seminars. There is another well-established social get-together at the end or beginning of every year. We are building a rich heritage, which will continue to advance agronomic research and provide a curriculum that allows graduates to contribute to the advancement and/or utilization of new knowledge. The future is bright for graduates of our programmes. There are ample job, including self-employment, opportunities which are not restricted to agronomic work alone.